I started off my day with a banana blueberry smoothie, which is made with Silk's Vanilla Almond Milk, frozen bananas & blueberries. No matter how often I drink this smoothie, I never seem to get bored of it! Dylan, my husband, made lunch, and he got a bit creative! He actually followed a recipe from The Edgy Veg for rice paper bacon, and made vegan Mac 'n Cheese using Daiya's Cheddar Style Shreds. Delicious! I had recently found peaches on sale, so I've been a bit obsessed with them lately! 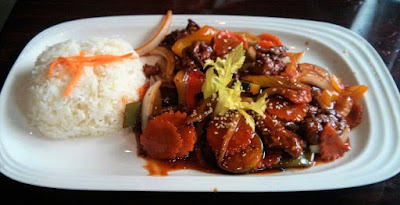 We ate out for dinner at Asian Stars, which we love because they have a fairly complete vegan menu in addition to their regular menu. I ordered their Orange Vegan Chicken, which was absolutely delicious! I normally order their Pad Thai (which is also incredible), but I'm glad that I ordered something different, as this vegan chicken was top notch! 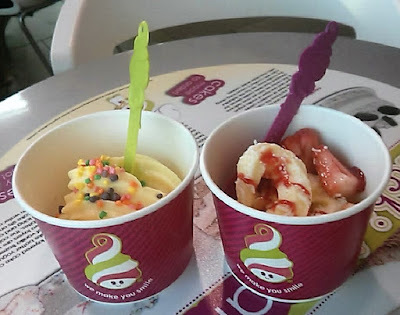 After dinner we headed over to Menchies, and we both got their pineapple sorbet, and I topped mine off with strawberry sauce & strawberries, while Dylan opted for Nerds. Just writing this post is getting me hungry all over again! Hopefully this food diary has proven that veganism doesn't have to be boring :) I hope you'll check back next Tuesday to check out another food diary. What foods have you been loving lately?